When you launch an Elastigroup, you can define the capacity units that each instance type would contribute to your application’s performance and availability. 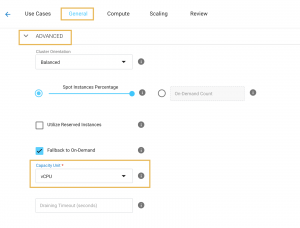 By using Instance Weighting you can now define more flexible scaling rules and to maximize overall cost efficiency while putting zero DevOps efforts. Normally, when an application scales, it typically does that in an Instance Unit, meaning, one or more Instances at a time, in most of the cases – it is the same instance type or size, for example, my application scales from 5 instances if c3.2xlarge to 15 instances of c3.2xlarge at peak hours. When you use the Elastigroup weighting feature, You can define a Target Weight Capacity for your application and specify a vCPU count. Elastigroup calculates the number of instances to launch by dividing the target capacity by the instance weight. In case that the result isn’t an integer, Elastigroup rounds it up to the next integer, so that the size of your cluster is not below its target capacity. But, first and foremost, Elastigroup will pick up the best server size or family according to their overall availability, pricing, and durability. You can now run, scale and manage heterogeneous clusters with ease. Note: To allow this option the Group Capacity should be set using the vCPU unit. If you want instances to be weighted based on custom units – you can add the weights parameter to the Elastigroup configuration JSON. This will allow you to gain higher accuracy in selecting the instances that will operate the workload. This can be based on ECU or available Memory.